September is a busy time for the RV industry – people are upgrading and accessorising their existing RV, be it a caravan, motorhome, bus or other RV type. Perhaps you’re buying a new vehicle or waiting on a delivery from the motorhome show earlier this year, or maybe you’re shopping for a ‘new to you’ second-hand model, have you scheduled in a visit to the September NZMCA Motorhome, Caravan & Leisure show? Also a perfect time for a ‘Father’s Day Giveaway’ from us, for the father figure in your life. Check out the Father’s Day special’s below – deals on subscriptions, Win books and more. As new owners Coen and Christine van Breda settle in to their new business, the finishing touches are all that remain to be done to their newly renovated offices and customer reception area at their service centre in Silverdale. The popularity of the newly introduced AA Solar vehicle health checks, along with new installations, battery and solar panel upgrades, convinced the new owners it was time for a fresh look at customer care, and making their stay pleasant and comfortable is an important part of this. Orewa, Whangaparaoa and the new Silverdale town centres are nearby, and AA Solar will be happy to advise on local sights and activities to occupy you while you leave your pride and joy in the hands of their experienced staff. Whether it is just for a couple of hours, or all day, there is no shortage of things to help pass the time. If you have not visited this booming area for some time, you will be very pleased with the selection of civic amenities, restaurants, factory shops, new shopping areas, parks, coastal attractions, walks and cycle trails. Zion Motorhomes has moved into its final site at 50 Gateway Park Drive in Pokeno, Auckland. Owner Jonas Ng is proud to see the Frankia, Dethleff, Morelo and lNiesmann+Bischoff luxury motorhomes being parked carefully in the huge indoor showroom, which is just part of the large complex set up for servicing of their own vehicles, running the McRent motorhome hire business from and offering an extensive array of up to 100 RVs for sale in the large yard. See all their models at the upcoming NZMCA Motorhome show at Mystery Creek in Hamilton. A uniquely designed, interior lightweight construction system for the RV industry. The system comprises strong, lightweight 11.5kg composite panels 2440 x 1220 x 19.8mm and 3mm lining sheets in modern new colours, along with a unique range of mouldings. The panels are manufactured in New Zealand, combined with specialised connecting and finishing mouldings, hardware, and adhesives to give flexible design for modern interior fit-outs. The system includes materials for kitchens, bathrooms, lounges, bed divans, drawers and made-to-measure shower cubicles. Duralite® provides a complete method of construction to achieve a professional finish – perfect for the DIY or commercial motorhome builder. Supreme RV are proud to present the new SmartDome automatic satellite dish. After extensive development we now have in stock a product that is fully backed by us with a 3-year warranty. Park up, turn on and within one minute you will be watching TV in your RV, caravan or motorhome. This SmartDome will mount as a direct replacement for the Satmark, Apollo or Majestic dome. Check out the website today W: supremeantennas.co.nz. Give us a call, drop in, or flick us an email and we will happily answer any questions. Phone: 0800 866 733 Mike or Leon. Find us at 8 Power Street Levin. Saturday, September 8 from 9am to 4pm is birthday celebration time at 169 Bush Road Albany, and 159 Orchard Road, Harewood, Christchurch. Lots of fun, in Albany only factory tours, a motorhome holiday plus family pass to Waitomo Caves to be won, accessory sales and discounts on RVs of all sizes, new and used. Also out, the latest technology electric motorhome prototype in Auckland. Check out the latest models to arrive in the country ready to drive away. The German Frankia from Zion Motorhomes has extras you have to see to believe. We checked out the latest UK-built A-Class Roller Team Pegaso from Nationwide RV; look for it at the Mystery Creek show. RnRV have the latest in their Carthago German-built fully integrated models at their Silverdale site. At Bailey NZ Distributors around NZ the fabulous range of UK-built Bailey Autograph motorhomes are on display, with the Advance range due in early September – lots of layouts in the under-3500kg range and options in larger sizes as well. If you’re looking for a luxury-fitted motorhome with plenty of living, sleeping and entertaining space, big boot storage for all the toys, a separate bedroom with multiple storage options, and of course a full-sized separate shower and luxury bathroom, I think this model will take your fancy as it did mine. Based on the Mercedes Benz Euro Sprinter 519 with a grunty 140kW 190bhp engine base; size-wise we’re talking 8520mm length, 2300mm width, height 3250mm external and 1980mm internal; weight-wise a GVM 5300kg, Tare 4650kg – a good payload at 650kg – so a COF and drivable on a car licence. Fit-out-wise the quality stands out on every level, but it is the combination of all the things you don’t see that makes this a motorhome to really explore all over. The control centre with the charging units, inverter, solar controller and the like is almost glamorous. The kitchen bench is a wonder of multiple-use sensibilities, and the second single gas hob ring with bench top piece, which has a stainless steel inserted base with plug drainage, was something I haven’t seen before. Add to this the two drainage plugs in the shower, the extra toilet canister that can be pumped into if required, and the separate water tank for drinking water – again not seen these before. They are just some of the classy features included in these German-built models. With so many extras to explore in this model, I suggest you read the review in the next issue of RV Travel Lifestyle, visit Zion Motorhomes in Pokeno, UCC motorhomes in Christchurch or see them at the NZMCA Motorhome show in Hamilton at Mystery Creek in September. Newly arrived at Nationwide RV dealers in Silverdale, New Plymouth, and Ashburton and priced to drive-away at $173,000, this fully integrated A-Class model will certainly be popular, especially with its habitation entry door being on the left passenger side. Based on the popular Fiat Ducato cab chassis with a grunty150 bhp Multijet 2 diesel engine, with 6-speed Comfort-Matic transmission. Size (mm): 7410(L) x2350(W) x 2950 external height, internal 2080mm. GVM 3500kg, Tare 3160kg, so a WOF vehicle despite its size. Are you looking for a vehicle with the all-important separate bedroom with island bed? A full-sized shower and separate toilet are on the must-have list? Love the ceiling beds that are so practical for the occasional guest, and so well hidden away? How about a vehicle with solar panels included, a bike rack for four bikes and a rear camera with monitor integrated into the rear mirror, all as standard features, not added extras. 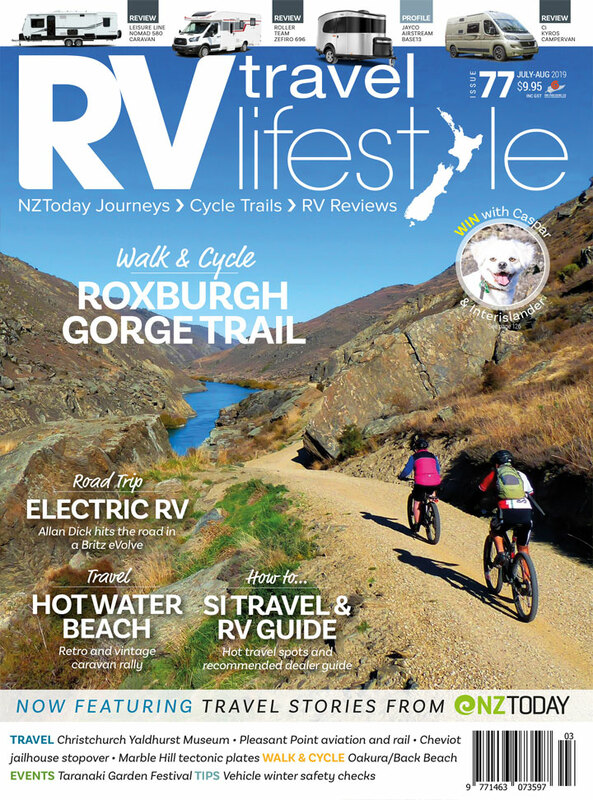 Read the next issue of RV Travel Lifestyle for the full review, or go to www.nationwiderv.co.nz for more details. The Carthago Chic S-Plus 58 XL – the latest German built A-Class luxury 8.5m motorhome has landed in Auckland at RnRV, with all the bells and whistles and ready to go you must check this out if your in the market for this sized motorhome. The Chic S-Plus 58 XL is based on a dual rear wheel drive IVECO 50C 3L 205hp/153kW, Euro 6 Turbo Diesel, dual wheel rear-wheel drive chassis. With 8-speed comformatic transmission, air suspension in front and rear, and the front axle is fitted with individual wheel suspension and torsion bar suspension, double wishbone and increased axle load capacity, rigid rear axle with parabolic suspension. This model is fitted with the RnRV upgrade that offers a KiwiSat Plus satellite antenna that works with the cool ‘Quick-up’ 32″ Avtex 12V TV TFT pull-out system behind the side-bench backrest. A cool coffee machine lift sits inside a roof cabinet, ready to be lowered for use. Add in the 160L auto three-way Dometic fridge/freezer. Fresh water of 235L and grey 200L. RnRV install minimum 400W solar panels to support the two 80Ah gel house batteries, a large rear boot garage measuring 2100x1400x1290mm offers up to a 450kg load capacity. With the long list of features, fixtures and fittings, I am sure this vehicle will tick off many boxes. Stop in for a look at Silverdale when next in Auckland; go to www.RnRV.co.nz or contact RnRV now for more information. Bailey Autograph motorhomes have arrived, and what a range to choose from with models on 3500kg chassis and up to 4250kg for the larger six-berth model; lengths range from a compact two-berth low-line starting at 6794mm up to the six-berth at 7988mm length. All models are based on the Peugeot cab chassis, with a grunty 2.0L Blue Hdi 160bhp 350Nm Euro 6 engine and six-speed manual transmission, perfect for New Zealand roads, while the ALKO AMC chassis ensures the drive of the vehicle is smooth and an easy drive for me on our test drive. A full Peugeot NZ-backed warranty on the chassis and the Bailey’s 10-year water ingress warranty is standard on all Bailey NZ motorhomes. Lots of extras are standard in these models – the Truma 100-watt solar panel, 18.5″ Avtex HD Digital TV, Waeco reversing camera and screen, Fiamma F455 wind-out awning, Alde Hydronic Compact 3020 programmable combined water and radiator heating, 93.5L grey- and 93.5L fresh water, a 145L tower refrigerator. The floor plans have something for everyone from two single beds in the rear, a rear French bed or the very popular rear island bed, and the secondary bed options include dinette bed conversions and a great sized ceiling bed. We love a rear U-shaped lounge and it was great to see that the Autograph 79–6 has that option – and a large comfy lounge area it is too. Read the review in the next issue of RV Travel Lifestyle magazine, visit a dealer, read about them online or come to the NZMCA Hamilton show in September at Mystery Creek. Check out these models at a Bailey NZ distributor near you – RV Mega Centre Mt Maunganui, DeLuxe Group Blenheim, TrailLite Caravans and Motorhomes Pukekohe and Christchurch, Pykes Auto Court Timaru. Road Life’s Rhys and Michele Hunter are the Kiwi face of the popular Australian brand, Sunliner. The Sunliner range is a fairly recent introduction to this country and its arrival a few years ago caused quite a stir. In an RV market crammed with options, the Sunliner with its light, bright and contemporary-coastal interior and washed-wood look floors is reminiscent of the feel of a Kiwi bach. With so many of the features local buyers were looking for in a recreational vehicle, it seemed that the Sunliner manufacturer had ‘channelled’ the best of Kiwi design. I well remember the ‘wow’ factor I felt when I saw my first Sunliner four years ago. The vehicle felt like a piece of me, and it was such a departure from the norm that I was intrigued to know more about the origins of the brand. I guess it should have been obvious that the man behind Sunliner was an ex-pat Kiwi, from Tauranga and now based in Melbourne, Australia, where he had been slowly building the Sunliner brand since the mid-1970s. I recently learnt from Michele Hunter that the company’s founder, Tony Hunter, started out building his brand a almost by accident when, in 1974, he customised his Kombi van. Everywhere Tony went people took one look at his van and wanted one of their own. As a result of this interest, Tony was soon custom-building vehicles to order. And that’s how the Sunliner brand began. And, yes, as sharp-eyed readers will have noticed, Tony, and the owners of Sunliner and UniCampa’s sole Kiwi dealership, Rhys and Michele, are related. Tony Hunter is Rhys’ uncle. Rhys grew up with the brand; and like Michele, he was Tauranga born and bred, so it’s fitting that the brand that had its beginnings in the city, has returned home. Most Tauranga motorhome and caravan dealers are located over the bridge in Mount Maunganui, but Rhys and Michele were strategic in choosing a corner site in the city that is easily accessed by the majority of their customers – who mostly hail from the popular east coast towns of Katikati, Bethlehem and Omokoroa. It seems like there is a lot of wisdom in a couple so young; I’m keen to understand more of their background. Rhys and Michele are still in their 30s and they have a young family, Jackson (4) and Ruby (2). They also have strong skill sets from their previous roles which have enabled them to step into building their new business, Road Life. Rhys previously co-owned a boat-related business, while Michele trained as a journalist, and was, before she became self-employed, the chief reporter for the Bay of Plenty Times. “A lot of our customers are friends, or friends of the family, and they love that we are youngish with a young family,” says Michele. As well as the interest in the namesake brand of Sunliner, second-tier motorhome brand Unicampa is also proving very popular – especially with younger people. These nifty vehicles are feature-rich, easy-care motorhomes designed with entry-level buyers in mind. Another aspect of the Road Life business is the busy service centre and workshop where three technicians are kept busy with installations, self-containment and anything to do with refrigeration – for which the company has known expertise. The NZMCA Motorhome, Caravan & Leisure Show bigger and better in Christchurch. Lovers of the great kiwi outdoors enjoyed a bigger show at Horncastle Arena in early July, at the NZMCA Motorhome, Caravan & Leisure show, the first since the exciting new partnership with the NZMCA. Thousands attended over the three days, which featured a large range of motorhome and caravan manufacturers and importers, new products, new and your favourite returning exhibitors and a huge marquee outside housing caravans from New Age Auckland and Auckland Motorhomes. And business was done. Exhibitors reported some fantastic sales over the weekend, with the shows VIP club growing considerably, signing up many new members. If you did become a VIP at the show… you can now look forward to special deals, exclusive opportunities and free entry to both the North & future South Island shows. Over 130 motorhomes and caravans made a great weekend of it and stayed at the NZMCA Event Park and Stay for FREE over the 3 days. Much fun was had and feedback from those that stayed was that they thoroughly enjoyed the show. Dave & Sally Brown stayed at the Event Park & Stay over the weekend, “As new show VIPs we thought we would give it a go at the park & stay and we loved it. It was a great chance to catch up with some old friends and make some new ones, as well as making it nice and easy to get into the show early to take advantage of the deals. Highly recommend it!” says Brown. And if you think this one was big…wait until you see the NZMCA Motorhome, Caravan & Leisure show at Mystery Creek in Hamilton September 21st – 23rd. This show is shaping up to be the biggest show yet!